New research from the University of Southampton has demonstrated that it is possible for communication from person to person through the power of thought alone. Brain-Computer Interfacing (BCI) can be used for capturing brain signals and translating them into commands that allow humans to control (just by thinking) devices such as computers, robots, rehabilitation technology and virtual reality environments. This experiment goes a step further and was conducted by Dr Christopher James from the University’s Institute of Sound and Vibration Research. The aim was to expand the current limits of this technology and show that brain-to-brain (B2B) communication is possible. His experiment had one person using BCI to transmit thoughts, translated as a series of binary digits, over the internet to another person whose computer receives the digits and transmits them to the second user’s brain through flashing an LED lamp. While attached to an EEG amplifier, the first person would generate and transmit a series of binary digits, imagining moving their left arm for zero and their right arm for one. The second person was also attached to an EEG amplifier and their PC would pick up the stream of binary digits and flash an LED lamp at two different frequencies, one for zero and the other one for one. The pattern of the flashing LEDS is too subtle to be picked by the second person, but it is picked up by electrodes measuring the visual cortex of the recipient. The encoded information is then extracted from the brain activity of the second user and the PC can decipher whether a zero or a one was transmitted. This shows true brain-to-brain activity. Watch Dr James’ BCI experiment. 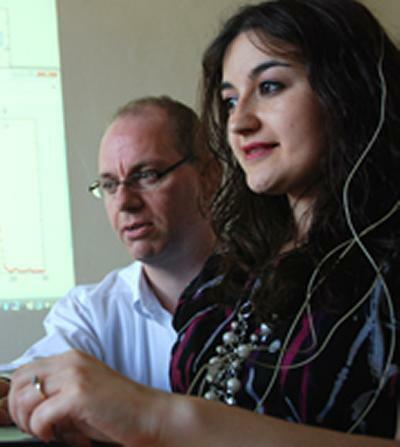 Dr James is part of the University of Southampton’s Brain-Computer Interfacing Research Programme, which brings together biomedical engineering and the clinical sciences and provides a cohesive scientific basis for rehabilitation research and management. Projects are driven by clinical problems, using cutting-edge signal processing research to produce an investigative tool for advancing knowledge of neurophysiological mechanisms, as well as providing a practical therapeutic system to be used outside a specialised BCI laboratory.